In this beauty editorial for Vogue Italia, Creg Kadel zooms in on Diego Da Silva and Fulvia Farolfi's unconventional take on the season's leading beauty trend. 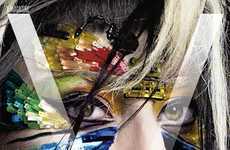 In only four looks, this creative team is able to give several interpretations of the hyper color makeup trend. The bright and neon pigments splashed and streaked across model Eniko Mhalik's face transform her into a tropical tribal beauty. Fulvia Farolvia's unique hairstyles combined with the artfully applied makeup creates an allusion to several breeds of tropical birds. Through digital manipulation of the images, a de-saturation of the model's complexion, the contrasting pigment splashes are dramatically heightened. Eniko Mihalik's modeling talent shines through the eccentric styling. 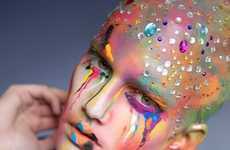 She gives the shoot a dramatic edge as she poses with a simulated passivity, which contrasts with the colorful pigment splashes on her face.